Semi-desert, foothills. Openings, woodlands. Spring, summer. This tiny Penstemon grows low and in small patches, primarily in the dry soils of the Pinyon-Juniper and Ponderosa communities, but it will grow to several feet in diameter and ten inches tall with abundant blooms if it receives good moisture -- as it did in 2005. Flowers are a very lovely pale lavender, about a half inch long, and with good moisture they profusely cover the plant. 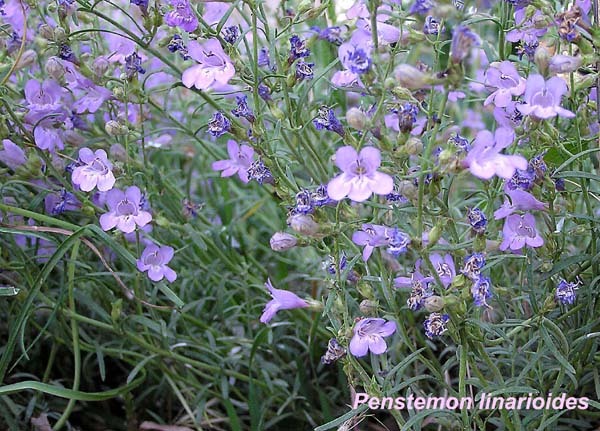 William Weber indicates that the species name refers to the similarity of the leaves of Penstemon linarioides to the leaves of Linaria, which in turn has its name because of similarities with Linum (Flax). And all of this is from the Latin "lin", a "line", i.e., they all have somewhat similar linear leaves. The suffixes "oides" and "aria" mean "similar to". The plant was first collected for science by Charles Wright in New Mexico in 1851-1852 and was named by Asa Gray in 1858.